On Friday morning, October 12, Dassault Aviation received the visit of the Indian Minister of Defence. Accompanied by a delegation from the Indian Embassy in Paris, Mrs. Nirmala Sitharaman went to the Argenteuil factory, which specializes in the manufacture of fuselages for Dassault aircraft. 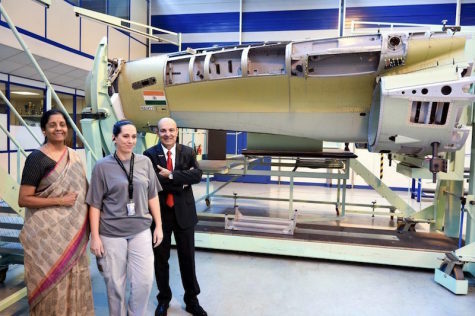 It is here that the fuselages of the 36 Rafales ordered by the Indian Air Force are manufactured. Mrs. Sitharaman walked through the workshops with Eric Trappier, CEO of Dassault Aviation. She was able to meet with the engineers, technicians and companions of the plant. She was introduced to the high technologies used and expressed her great satisfaction with the progress made in the production of Rafale fuselages.